Earlier this year, we reported on SmartWood’s certification of Hancock Victoria Plantations, Australia. We have been asked to post this update by Anthony Amis, a local expert. Further images and details are available at Hancock Watch. In October 2006, an historic Heads of Agreement was signed concerning rainforest protection in Victoria’s Strzelecki Ranges. The deal was announced by then State Conservation Minister John Thwaites. In essence, the deal worth $7 million would buy back key rainforest and wet eucalypt forest buffers back from FSC certified Hancock Victorian Plantations (HVP). The reserve would then be managed by the Trust for Nature. The Reserve known as the ‘Cores and Links’ Reserve would link the Nationally significant rainforests and wet forest buffers of Gunyah Gunyah to Tarra Bulga National Park, a distance of about 30km. The entire reserve would be about 8500ha, with approximately 2400ha of 30 year old reforested Eucalyptus Regnans forests. Nineteen months later, the deal is stuck in limbo, with the new Conservation Minister still attempting to negotiate the deal with Hancock. Community representatives are feeling disgusted with the attitude of Hancock who continue to demand unrealistic logging volumes, that exceed by almost 50% the volumes agreed to in the lead up to the signing of the deal in October 2006. May 2008 Strzelecki Ranges/Jack River catchment: Kelly Track inside Strzelecki Cores and Links Rainforest Reserve. Hancock have started logging this controversial area with no consultation with local community groups, despite signing a Heads of Agreement supposedly protecting this rainforest area in October 2006. 19 months after the signing Hancock are ramping up their logging regimes inside the reserve in order to meet unsustainable contracts to Maryvale Pulp Mill. Not only has the community had to put up with the antics of Hancock wanting as much profit as possible out of the deal, but the community has also been undermined by head bureaucrats from the Department of Sustainability and Environment (DSE). DSE have also been actively ‘white-anting’ the deal, hoping to take control of the supposed Reserve in order to log it themselves in the future. Recent documents revealed under Freedom of Information show that the DSE and Hancock were working together on a deal, before the community was invited into the negotiations. By May 15 2006, HVP and DSE had already worked out their 3 options regarding the deal. The first meetings held between Ministerial staff and the community occurred on May 18, 2006. The FoI also reveals that by August 2006 Hancock’s preferred option was to log 400,000m3+ of custodial land including large sections of the Cores and Links. Under Freedom of Information, DSE has refused to hand over 126 documents relating to this issue, with 12 documents only released in part. This reveals that a massive cover up is occurring. One has to wonder why, when this was supposedly a Reserve set with support of the Conservation Minister, community representatives and FSC-certified HVP. The major sticking point in negotiations leading up to the deal was the issue of shortfalls. Hancock claimed that because of failure of 1,000 hectares of bluegum plantations elsewhere in Gippsland, they would have a 600,000 cubic metre shortfall in their contract (which runs out in 2027) with the major buyer of pulpwood in the region, Australian Paper (PaperlinX). Hancock further elaborated that by 2016 they would be looking at a shortfall of 100,000m3 per year for six years. After this time, their newly planted Shining Gum plantations would supposedly be able to meet contract volumes. Hancock then claimed that to make up this shortfall, logging of approximately 1,000ha of the Cores and Links would have to occur. Community negotiators whilst not happy with this outcome realised that this was a key hurdle that probably could not be overcome and reluctantly granted a once only logging of ~900 ha of 30 year old trees, to occur in the cores and links to meet these contractual shortfalls. Any volume that could not be met by logging their 30 year old mountain ash trees inside the Cores and Links, would then by met by logging a small amount of native forest ‘outliers’, possibly 100 hectares. During negotiations Hancock’s manager let slip that they were working on a logging volume figure of ~300m3/ha. In actuality HVP get between 500-600m3/ha in their hardwood coupes. 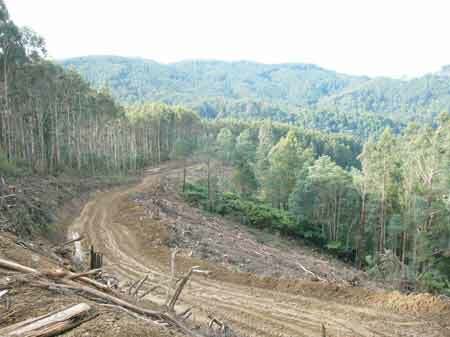 This deliberate downplaying of volume gave Hancock the excuse, that not only would they need to log about 1,000ha in the cores and links, but they would also need to log several hundred hectares (up to 460,000m3) of native forest in their estate to meet the supposed 600,000m3 figure. Soon after the deal was announced on October 13, 2006, Hancock’s real agenda was highlighted in an email from their Gippsland Manager claiming that Hancock assumed that the Heads of Agreement meant they could log inside the cores and links, with all contractual shortfalls to come from 460,000m3 of native forests/custodial land, which mean the logging of several hundred hectares of company owned native forest! This point was reaffirmed by HVP CEO in April 2007 with the company now claiming a required volume of 835,000m3, (which if you include sawlogs) would mean a blow out to 1.1 million cubic metres, almost 50% above the supposedly agreed 600,000m3. This has nothing to do with anything negotiated during the Heads of Agreement process which occurred between May-Sep 2006. It’s now almost 20 months after the Heads of Agreement was signed. The community has not gained their Reserve, the Minister has now left office and Hancock continue to log what they can, often in breach of conditions set under the Heads of Agreement. DSE have done nothing to implement spot audits and monitoring of volumes coming off coupes are compiled by Hancock with noone in Government overseeing the numbers. The whole process is now a farce, with local media now shedding light on the dubious ethics of Hancock and DSE. Hancock continue to be certified by FSC, despite their undermining manipulation of process. Maryvale Pulp Mill, the source of between 70-80% of the Cores and Links Rainforest Reserve timber logged by Hancock also continues to glow in the light of FSC CoC Certification.